The first stage of meditation consists of calming the mind so that we can see more clearly what it is doing. Our posture when meditating is of the utmost importance. An incorrect posture can bring with it a certain number of risks or dangers: leaning to left or right, backwards or forwards, when we meditate is by no means without effects which will then make their appearance in our state of mind, causing us to lose our equanimity. The ideal posture is called the seven-point posture of Vairocana and if we expect to meditate regularly, we must gradually train our body until we can remain in this posture for the duration of the session. 1. The legs are crossed in the full lotus position, referred to in Tibetan buddist texts as the vajra position because it symbolises indestructible equilibrium. This will calm the subtle energy in the body which favours the appearance of jealousy in the mind. 2. The hands are placed side by side at the top of the thighs. This will encourage the pacification of the subtle energy associated with the emotion of anger. 3. The shoulders are spread out, like the wings of a vulture: this means that they are raised up and out to the side, neither hunched forwards nor pulled backwards. 4. The neck is curved like a hook, the chin pressed against the larynx; again, this means pulling the chin directly into the throat, taking care not to tip the head forwards or throw it backwards when taking up the position. This inhibits the action of the subtle energy relating to desire-attachment in the mind. 5. The spine is straightened, like the shaft of an arrow. This will mean readjusting your center of balance by moving the body back slightly from the waist upwards while at the same time bringing forward the abdomen. This, together with the position of the shoulders described in point three, serves to calm the circulation of the subtle energy through which mental dullness makes itself felt. 6. The eyes look without strain at a point in space about four fingers away from the tip of the nose. 7. The lips are just touching, leaving a slight space between the upper and lower teeth, the tongue resting relaxed against the roof of the mouth. Points six and seven pacify the subtle energy associated with pride, leaving the mind at the same time bright and clear. Ask a qualified and experienced teacher to supervise your posture until you are sure you can do it correctly. The circulation of the subtle energy in the body is very sensitive and great care needs to be taken so that it does not affect the mind of the person meditating, who is after all trying to cultivate non-distraction and clarity. Using a Reference Point 1. Some people like to have all sorts of feelings, vibrations, sensations, energy etc. when doing meditation. This is just fantasy. No exotic effects are intended. First the mind has to be trained to settle on a single reference point. Up until now the mind has had many reference points, it projects them very quickly one after the other, whirling around like grains of sand blown by the air. Try to bring back the scattered mind to one point. Let the mind think of one thing for a change, rather than many things at once. We train the mind to do this by keeping it on an object of some sort. This works for a few moments, then we find the mind will not stay put. Why? Because it is used to thinking a lot. Staying on an object is the opposite of what it is used to do, so we have to help it develop new habits. Use something like a clean glass of water or a candle as your meditation object. The candle should not be too bright, and rather than looking at a flame directly, place the candle behind your right or left shoulder and a mirror in front of you so that you are meditating on the reflection. If you use a glass, place it so that the natural daylight falls on it, although not the itself. In this way the eyes will not feel strained. The clarity of such object helps the mind avoid becoming drowsy. Direct the mind towards it and settle there. Each time you become aware that you have been distracted away from the object, bring the mind back to this one point. Sometimes it may take a few minutes before you realise this and bring the mind back. Don’t worry, continue your meditation, gradually extending the amount of time remain on the object. The key to this practice is to rest on the object: BE AWARE – it is this that diminishes the thoughts, not the object itself. You should not be noticing the features of the object – the light or the color of the candle and so on. The object itself is of no importance at all, it is just the mind’s method keeping still. Once the mind is settled, the object is no longer of any value. Some people like to have all sorts of feelings, vibrations, sensations, energy….when doing this meditation. This is just fantasy: the use of an object is a way of settling the mind with no intended exotic effects. Using a Reference Point 2. By taking love and compassion as our reference points on which to settle the mind, we reap a double benefit. As with the candle and the glass, the mind becomes peaceful and stable. But when the mind is still it identifies with the object, so here we have a special opportunity to actually transform the mind into love and compassion. At the moment the average person cannot develop love and compassion towards all sentient beings. We do feel love but it is limited to a few people, like when we feel love for our girl- or boyfriend or our parents and so on. We must have a method to increase this love to cover all sentient beings, and using love and compassion as reference points for the mind does just that. A sentient being is one with a mind. Buddist logic has a way of proving that from human beings to mosquitos, even to the beings in hell, all have a similar mind. There is a difference between life and sentient life. Life grows (a tree, for example) but it does not possess a mind. Sentient life is life with a mind. A flower cannot reach Buddhahood – it has no mind. A mosquito can, however, despite his present unfortunate condition. 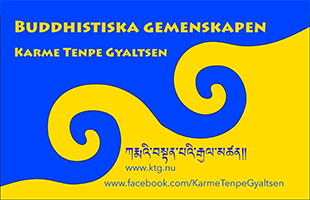 All sentient beings share the same wish to be happy and free of suffering, We should develop love and kindness to all of them impartially. We must start by feeling love and compassion in our mind. The best is to have a naturally loving mind – if this happens it comes from past habits. If however this is not the case, you can create them artificially. At first a deliberate effort is needed, but by the blessing that comes from your pure intentions you will slowly come to have original love and compassion. The essence of love is joy. Develop a state of mind full of love and joy, the wish to be of benefit to others. Feel this towards an imagined group of about ten beings, people or animals. Really be aware of the love. It is not enough to say ’How nice this cat is! Then increase the scope of this to take in a hundred, a thousand, tens and hundreds of thousands of beings. Imagine them. Then go on extending your love all the time until it encompasses all sentient beings in the universe. When you have this feeling of love and kindness for all beings in your mind, treat it just as you did the object and meditate on it without distraction. Each time the mind thinks of something else, bring it back to the thought of love and kindness, stabilizing the mind on it. All your thoughts will be transformed into the nature of love and care. This is training oneself in the skills of mental calm using love. From time to time do the same thing with compassion. Compassion is nearly the same as love. It means to think of the difficulties and problems of all sentient beings. This is the feeling you have when your children or parents suffer, for example. But there is nothing sorrowful about it. You can easily develop a feeling of compassion in your mind by thinking of the terrible suffering of sentient beings. As you did with love, stabilize the mind on that and don’t allow yourself to be distracted away from it. Alternate love and compassion, cultivating them steadily not all in a rush. Using them as objects will not only pacify thoughts but also accumulate a great amount of virtue. This love is free of attachment. It is not the crazed passion of ’being in love’. Mind’s essence is empty unhindered clarity, and even while developing love and compassion the mind should relax gently into its essential emptiness, otherwise the love and compassion developed become emotional since the mind remains fixed. Mixed with emotion, love and compassion are unskillful, and can lead to disaster. Many people are unaccustomed to the empty quality of mind; their thinking is too materialistic. Do not fix the mind as if it was a machine. Real love is without stress, soft but vast. All sentient beings’ minds are essentially the same as yours: empty unhindered clarity. So think that all sentient beings meditate together with you, immersed in love along with yourself. This is a very powerful practice, bringing great benefit and a vast accumulation of merit. It is the way that bodhisattvas create conditions for the spontaneous development of love in the minds of others. Share your loving mind with others and make them feel the same. All beings have a loving mind, but because of emotional problems it does not show itself, or if it does, it remains limited, partial, always based on I and you. Aim your mind at that and make it as big as yours. Meditating on a candle or a glass, or becoming absorbed in love and compassion are really only techniques to stabilize the mind, they are not yet true meditation. But mastering them is Indispensable to the next stage, since it is through them that the mind gets used to finally remaining still. You may have to practise them over a long period of time before you are ready to go on to the practice of meditation itself.